When you shoot a good location for nearly four complete days and take nearly 4000 shots, you tend to get bogged down trying to sort shots out, deciding which are worth keeping and which aren’t. Luckily, some shots just stand out as “keepers.” These, along with a few of those I’ve already posted, were obviously keepers. Though I tend to prefer photographs of mature Bald Eagles with their brilliant white heads and tails, two of my best shots this year were of an immature Bald Eagle, and they may both be of the same bird taken on different days. This shot is hardly cropped at all, though I framed it a little so that the bird was closer to the right edge of the frame. On the other hand, this one of a mature Bald Eagle diving had to be cropped dramatically and probably would never work as a print. This was taken much closer as the eagle turned overhead to drop down onto the beach. It’s definitely the unusual angle that appeals to me. On this shot, though, I had to back up to keep the eagle in the frame (click on it to see a larger version) . 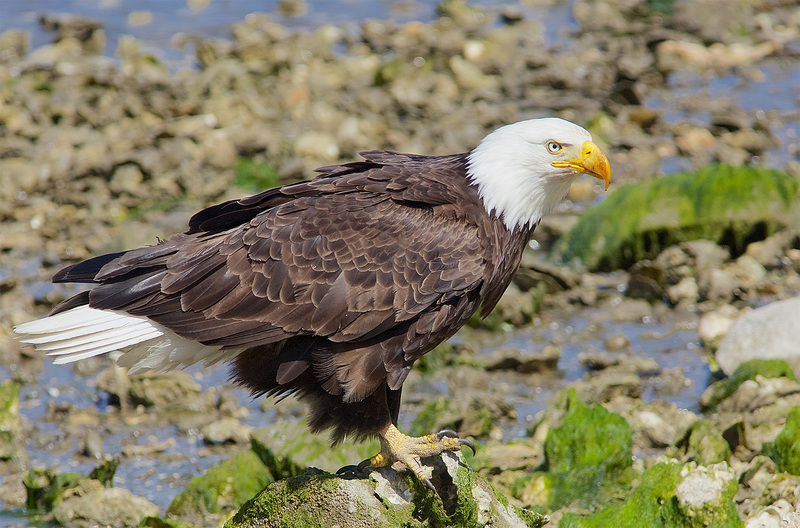 It’s hard to believe you can actually get this close to a Bald Eagle outside a zoo. Just catching up on your wonderful photographs, Loren. Of the bald eagles, it’s the third one which does it for me. Iconic. And that wingspan! Just amazing. Really like that “unusual angle” one. I tried photographing curlews in flight the other day. Ended up with loads of blank sky – the bird having just flown out of the frame as I clicked the shutter. Frustrating. And then I saw one stood, posing… Only the camera was back in its case. Shooting birds in flight just takes lots (and lots) of practice. You’re also more apt to get a usable shot if you shoot rapidly. And yes, I missed the best shots on my last photo outing because I didn’t have my camera readily available.